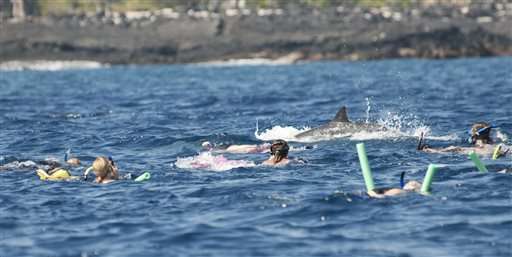 Allison Alterman likes to swim in the ocean for exercise near her home on Hawaii's Big Island. Sometimes her swimming group will see spinner dolphins gliding or jumping near their course. If the dolphins stick around, tour boats will inevitably show up, sometimes 20 at a time, all dropping passengers with floaties in the water for a swim. For many, it's a chance to realize a long-held dream. For the dolphins, however, they "come into the shore to rest and it doesn't seem like they're able to do that because they're surrounded," Alterman said. Scientists are concerned the intense interest is harming the nocturnal animals because they need to rest after foraging for food all night. Now, the National Oceanic and Atmospheric Administration is preparing to propose rules to help protect the dolphins. The agency could ban swimming with Hawaii spinner dolphins or prohibit people from shallow bays when the dolphins are resting. "Disturbing their resting behaviors can actually affect their long term health and the health of the population," said Ann Garrett, the assistant regional administrator of the National Marine Fisheries Service's protected resources division for the Pacific Islands. Garrett said the agency plans to propose rules in June. The regulations could affect over 200 dolphin-related businesses operating in the state as well as recreational swimmers and other ocean users. Claudia Merrill, co-owner of Dolphin Discoveries in Kailua-Kona on the Big Island, said she would welcome some regulations, particularly if rules would prohibit swimming with dolphins during their prime resting hours from late morning to mid-afternoon. Tour operators must be educated to watch for the signs when the dolphins are settling into their rest state, Merrill said. 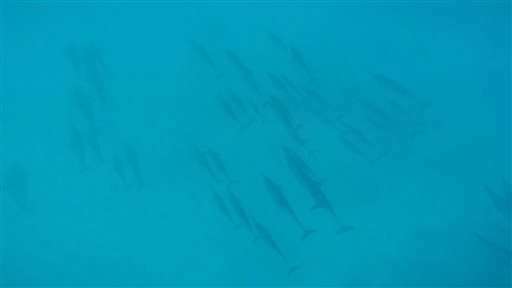 One key indication is when a pod of dolphins synchronizes its dives and swims. "It should be a sustainable industry. It can be a sustainable industry," Merrill said. 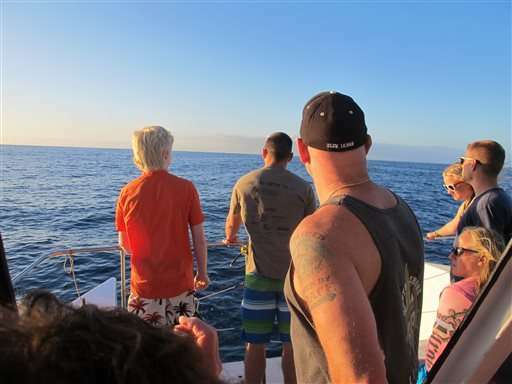 Some Kona operators follow guidelines that local tours established, which include avoiding four dolphin resting bays between 10 a.m. and 2 p.m. But Merrill said only three of the 12 Kona coast tour operators she knows of follow the guidelines. Hawaii's spinner dolphins feast on fish and small crustaceans that surface from the ocean's depths at night. When the sun rises, they head for shallow bays to hide from tiger sharks and other predators. To the untrained eye, the dolphins appear to be awake during the day because they're swimming. But because they sleep by resting half of their brains and keeping the other half awake to surface and breathe, they may be sleeping even when they're maneuvering through the water. Julian Tyne, an honorary postdoctoral researcher at Australia's Murdoch University, said spinner dolphins off the Big Island were exposed to human interaction about 80 percent of the time over the three years he studied them from 7 a.m. to 6 p.m.
Tyne said he doesn't know whether this human interaction is changing dolphin behavior. But he said the dolphins may not be resting as deeply as they need, which could harm their ability to forage for food at night and their ability to reproduce. The fisheries service first signaled it would consider regulations in 2005, after tour offerings exploded the previous decade. 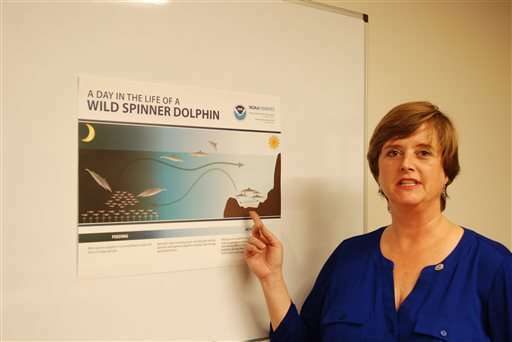 But instead of proposing rules, officials have sponsored research to better understand spinner dolphin behavior and promoted a voluntary program that discouraged swimming with the animals. But the guidelines have done little to deter dolphin swim tours. The Marine Mammal Protection Act prohibits harassing dolphins, but swimming with them falls into a grey zone under the law. Federal authorities have prosecuted tour operators for feeding bottlenose dolphins in Florida waters, but dolphin feeding has never been a problem in Hawaii. Jennifer Hall, a musician visiting from Chicago, joined about ten others on an early morning tour from Waianae about an hour's drive from Honolulu on Oahu island. They jumped in the water to see dolphins swim back and forth, surfacing and descending to the ocean floor about 20 to 25 feet below. Some tourists attempted to swim after the dolphins, but guides held them back saying they should "observe not disturb." Their boat, together with about five others, formed a large semicircle around the animals. Hall said she felt like she shared with the dolphins the serenity and calm of being in the water. Her partner Noam Wallenberg, a songwriter, said it was "mind-blowing" and "vastly different" from seeing animals in a zoo. "Being with creatures of the ocean right there and seeing them in their natural habitat was really wonderful. So beautiful," she said.